"Three years from now I hope I'm doing the longest run on JSA and The Flash ever." In Parts One and Two of this interview, Geoff Johns talked about what has been and what will be on his DC work. Today we cover the things he dreams about doing, and where does a hot writer go from here? DM: You mentioned in San Diego that one of your dream projects is Captain Marvel. GJ: I love Captain Marvel. DM: So you’d love to play in his sandbox? GJ: I’d love to play with Captain Marvel. He’s been in JSA for two issues. We’ve been talking about him, so we’ll see. We’ll see what we do. DM: We’ll leave it at that. GJ: There’s a lot of people that want to play with him. GJ: If we get to play with him a little bit in JSA, and then someone comes up with a great book for him or a great take on him, great. If eventually I get to it, fantastic. DM: I have a question that Phil Jimenez could not answer for me. If Wonder Woman gets her super-speed from Hermes, is she tapping into the Speed Force? GJ: No. That’s more magical. DM: Then I’ll e-mail Phil and tell him. GJ: That’s on a different plane. Wonder Woman is not connected. This is how you can tell when a person is connected to the Speed Force: when they move fast, their body crackles with electricity. When your muscles process the Speed Force, the waste product is an electrical discharge. And that’s what these electrical discharges are. They’re not very powerful or harmful, but they’re bright. DM: There we go. We may have put a lot of message board arguments to rest. Good. GJ: That’s why Jesse Quick has it, Impulse has it, Max Mercury…they all have it. It’s not because of the costume. It’s because of the process. DM: Which do you find more satisfying, working in Hollywood or working in comics? GJ: They’re both good. They both can be really frustrating. There’s just stuff you have to deal with, people and things every day. It’s like every other job. It’s a lot of fun when everything is going smooth. It’s a little rough when things aren’t the way you want. 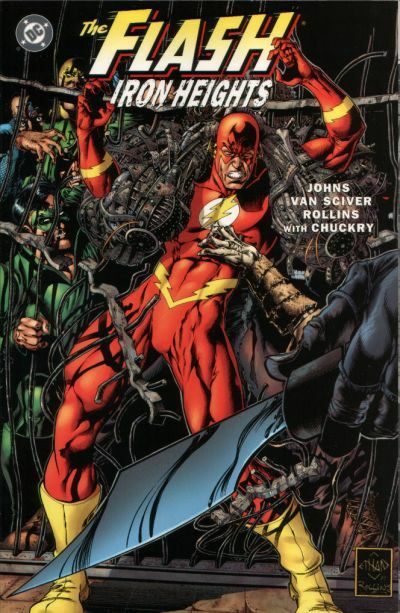 Everybody eventually leaves a book, so when I eventually leave JSA or The Flash, it’s not going to be a good time. But that’s the way it is. DM: So what are the weirdest, or funniest, moments in comic book movie development that you’ve had? GJ: The weirdest one I heard second-hand. I hate to bash Warner Brothers, but I’m going to. GJ: Warner Brothers really needs somebody that knows DC Comics, and that knows Hollywood and film, and can develop these properties at Warner Brothers in-house. If Warner Brothers is not going to produce them, then they should co-produce them with other studios. They’re sitting on a gold mine that they don’t know. Marvel has every property, I mean Ecto-Kid, for gods’ sake, just got optioned. I mean this is just insane, when you have hundreds of DC characters and properties and ideas that are stuck at one studio, and that studio will not make any major superheroes until they figure out how to fix Batman and Superman. DM: And you’ve got four Batman and Superman projects in development. GJ: Exactly. Running in the air. They’re going to say no to Green Lantern, they’re going to say no to Flash, say no to any of the characters below that, until they…they think they have to concentrate on Superman and Batman, and they can only do two at a time. My personal feeling is they really need to re-consider what they have. And they just don’t see it. They’re just not in tune enough. Because Marvel is going to blow up, as far as films go, it’s just going to explode in the next five, ten years. They’re going to have Hulk, Daredevil, Spiderman 1, 2, 3, X-Men 2, 3, 4. They’re going to have all these huge movies coming out, and DC, if we’re lucky we’ll get another Batman and a Superman movie, and maybe a Wonder Woman movie down the line. It’s sad. Hopefully, other things will happen, and hopefully I’m completely wrong. I mean I hope I am. But from what I know, my viewpoint is, I really wish that Warner would set up their own in-house development at Warner Brothers. That’s the key — at Warner Brothers. DM: What is that weird second-hand story (referred to above)? GJ: That weird second-hand story is they won’t do a Green Lantern movie because they think the ring is silly. And I said, look, then there’s no hope. There’s no hope, man. We’re done. DM: You’ve worked as a screenwriter. I read somewhere that you did some re-tooling on Lethal Weapon 4, but I’m not really familiar with the rest of your work. GJ: No, I didn’t do any re-tooling on Lethal Weapon 4. I worked on it, but I didn’t write the script. I did commentary on the DVD, and I think that’s where people get that idea, that because I did commentary I wrote the movie, but I didn’t. DM: Let’s say your dream comes true. You’ve got a guy in Warner Brothers developing comic book properties in-house. You get the green light to do your comic book movie. Which property is it, and what would you do with it? GJ: I would do…good god, that’s tough…um…(long pause)…give me a second to think cause it’s…I think I’d do Stars and S.T.R.I.P.E.. I think that would be a really fun movie. And I’d love to see a giant robot running around. DM: Would you tie it back in to the whole Sylvester Pemberton thing? That would be hard. GJ: I would sort of do that. But you can do it in a world where superheroes used to exist and now they don’t because all the villains are gone. Maybe superheroes are considered lame now. People make fun of them. They haven’t been around in forever, and there’s one villain left over that’s starting to get power again, and you’ve got to come in and take him out. Something like that. DM: What advice would you give to someone who wanted to break in to comics writing? GJ: Write something else first. Get published. Get published elsewhere first. Working in the movie business first, of course, was a huge help for me, because it got people to take my proposals seriously. The trick is to get people to read your stuff and give you a chance. Writing is a lot tougher than art. Art you can throw a page in front of somebody, they can tell right away if they like it. For reading, they have to take the time and think about what they’re reading. And then take the time to say okay, this idea is cool, let me see your script and see how it is. Writing is a lot tougher. You have to prove yourself elsewhere, I think, before really getting into comics. DM: Would you ever want to play over at Marvel? GJ: Yeah, I’m doing a mini-series called Morlocks for them right now. It’s coming out in February, with Ethan Van Sciver, the guy who did Iron Heights. I would love to play with Hulk. I love Hulk, I love the Fantastic Four, I love Captain America. I love all the major Marvel guys. I’d love to do something at Marvel on a monthly basis, I just don’t know where that would ever be. They’ve got so many great books out right now, and so many great teams, it’s really pretty cool to read their books. DM: And pretty hard to want to break anybody up. GJ: Yeah, it is. I’m really excited with everything going on there. DM: Where do you want to go from here? Say, three years down the line, are you still planning to be hot and heavy into comics? GJ: I’ll be into comics for as long as I can be. And that means as long as people will hire me. As long as people will hire me and I’ll have the time, I’ll be in comics. Because I love comics. Three years from now I hope I’m doing the longest run on JSA and The Flash ever. And I hope Hawkman is going strong. That’s what I hope. We ended there, grateful to Geoff for taking the time out to talk. If you have not already, pick up his book The Flash: Iron Heights. And maybe write to Warner Brothers to see what we can do about this Stars and S.T.R.I.P.E. movie.